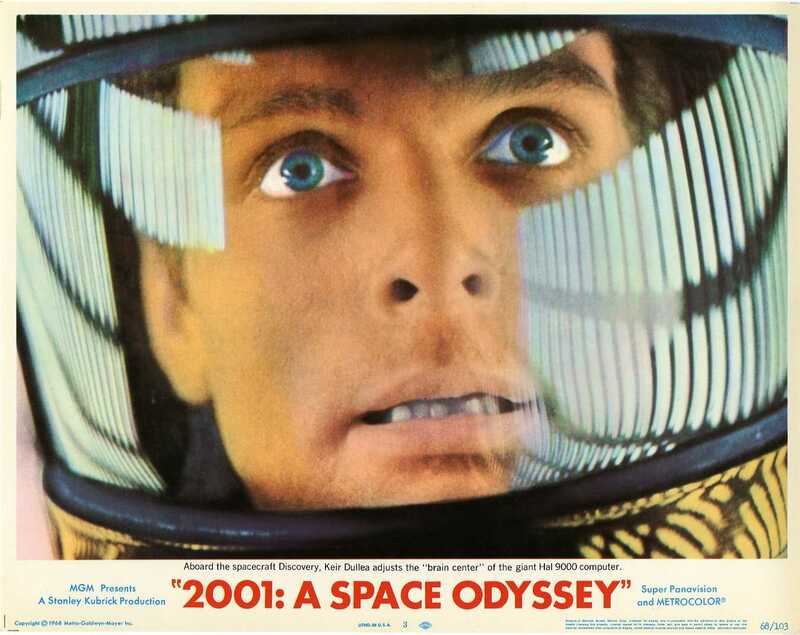 CWE Entry: 2001: A Space Odyssey | Films Like Dreams, Etc. 2001: A Space Odyssey is a film that, while primarily shows off its lengthy takes and Steadicam filmmaking typical of Kubrick movies, is also renown for its flashiness and interesting portrayals of light and color. About 3 minutes into the film, right after the musical introduction and the company credits, the famous opening scene features a Sun-Earth-Moon alignment (which is also the title screen) set to the Also sprach Zarathustra beginning. During this scene, the sun shines directly into the camera; it seems to be much brighter in contrast with the pitch black sky. This entire scene lasts for about a minute and a half, until the music stops. Immediately following this is the Dawn of Man sequence. There are a few opening establishing shots which feature a desolate landscape bathed in a very bright orange sunlight. These are only the first 4-5 shots of this sequence and lasts for about 30 seconds overall. About 14 minutes in, the monolith is first introduced to the tribe of early humans, who marvel at its presence. During this scene, there are a couple of quick edits to a shot from below the monolith facing upward (presumably through the hominids’ perspectives). These shots portray the sun shining over the monolith and directly at the camera. These shots (2) last only about 3-5 seconds each. About 19 minutes in is the famous edit, set across millions of years, featuring a bone being thrown into the air cut to the Pan Am space plane orbiting Earth. This edit juxtaposes two separate images that are very visually contrasting from one another; the latter is set across the sunny, blue sky, while the latter is set in the dark confines of outer space. There are multiple scenes throughout the rest of the film that depict Earth and its surround stars, planets, are satellites as very bright. Earth in particular seems to be bathed in a glowing, white aura. Generally speaking, moreover, bright lights and glowing, blinking screens and buttons are consistent throughout the entire film. Around the 25 minute mark, Dr. Floyd (Sylvester) enters into a room where he discusses with scientists and colleagues about rumors regarding an epidemic at Clavius. This room has very white walls, with brightness that persists throughout this entire scene. It lasts for about 8 minutes and ends with a quick cut to black. During this scene, Floyd also partakes in a video phone call with his young daughter back home. A TV screen is featured in these shots, but there is no static or quick, jarring movements or imagery. The whole phone call lasts for about two minutes. Around the 41 minute mark, Floyd partakes in a meeting at Clavius where he discusses his mission. The room in which this meeting takes place has glowing white walls all around, similar to the earlier scene in the space station. This entire scene lasts for about four and a half minutes. Around the 58:30 mark, Dr. Dave Bowman (Dullea) and Dr. Frank Poole (Lockwood) are shown eating inside the spacecraft while watching themselves on pre-recorded BBC interview, wherein they discuss the HAL 9000 computer and its functions. At the start of this interview, the TV screen shows a few quick moments of flashing images, followed by a second of static. This whole scene in general features a few shots where there are multiple screens portraying moving images; these images are relatively minimalistic, with little color or textual detail. Through the scene, these scenes are constantly entering and leaving the frame of the film. This whole scene lasts about five minutes. At the 1:04:00 mark, Frank is receiving a video message from his parents back home, who wish him a happy birthday. The TV screen in which this is shown is turned on during a close-up; in this shot, numerous flashing buttons on the right side of the frame is also shown. The next edit during this scene shows the video playing from much further away. The message closes with the two singing the “Happy Birthday” song, and then with Poole’s father saying, “See you next Wednesday”. A brief second of static is shown before the screen turns off entirely. This entire scene lasts about two minutes. As is probably evident by now, TV and computer screens are consistently and constantly shown throughout the film’s duration, although usually with dim, flat lighting and minimal flashing. Although the film is very sparse in its usage of fast-paced editing or jarring camera movements, there is a moment worth mentioning at the 1:32:00 mark. This is the scene where HAL severs Frank’s oxygen cable during a space walk, causing him to float adrift into space. Immediately before this moment, there are a series of about five quick cuts, each one zooming closer onto HAL’s “face”. This part only lasts about a second, with the rest of the scene returning to conventional filming and editing. At the 1:36:00 mark, there is a close-up of a flashing radar-like image on a computer screen for a few seconds. Unlike the other moving screens shown in this film earlier, this screen flashes at a strobe-light effect intensity and frequency. Around the 1:50:00 mark, after failed demands to have HAL open the ship’s pod bay doors, Dave opens the emergency airlock manually and proceeds to deactivate HAL. While walking toward the computer, a sudden though subtle use of shaky cam is visible. He enters the processor core, which is a very bright, red room that seems to glow from the inside. Also while deactivating HAL, he detaches a sequence of glowing white bricks from the walls of this room. Near the 1:56:00 mark, a flashing TV screen appears on the in the frame, where a pre-recorded message from Dr. Floyd reveals the existence of the monolith on the moon. This screen is very bright and also in the manner of a strobe light, with very quick, erratic flashing. The appearance of the screen lasts about a minute, while the scene as a whole lasts about 7-8 minutes. Around the 2 hour mark, the climax of the film begins with Dave’s pod being pulled into a space vortex. Here, he (along with the viewers) witnesses a series of flashy, colorful lights that zoom toward the screen. For a few seconds at the beginning of this scene, there is an extreme close-up on Dave’s face for a few seconds, also featuring some very intense shaky cam. While these unusual colors are not flashing, they do get brighter and more intense with passing, while also taking up the vast majority of the space within the frame. Spread throughout this lengthy sequence are a few quick instances of editing, cutting to a single image of Dave’s face; these still images stay on the screen for only about half a second. There are also a few more quick instances of editing onto an unusually-filtered, blinking eye, followed by a series of stars, galaxies, and other astronomical phenomena. All of this bright, colorful shapes and psychedelic imagery is set alongside a pure black backdrop, making the visual contrast seem all the more heightened. As a whole, this is a very visually intense and stimulating scene, which lasts for about 15 minutes. Immediately following this scene is one that features Dave suddenly in a mysterious room, glancing at different versions of himself throughout his lifetime. The room in which this takes place has very white walls, although not particularly as luminescent as previous white-walled rooms in this film. At the very end of the narrative (around the 2:19:00 mark), Dave attempts to reach for the monolith at the foot of his bed, only to be transformed into a human fetus. This fetus is shown encapsulated in an orb of glowing white light. A close-up of this being is shown for about ten seconds before proceeding to the final scene of the film. This scene shows this glowing being floating alongside the giant glowing earth, gazing upon it. These shots are shown for about a minute and a half – about the same length as the opening scene, as Also sprach Zarathustra also plays over this part – before the entire shot fades to black. Consensus: Depending on one’s level of sensitivity regarding visual stimuli, this film could be either really irritating or hardly bothersome at all. Most of this film takes place in the dark confines of space; while this means that bright lighting is hardly an issue, it also means that the artificial lights that are present can sometimes be disorienting. Most of the flashing screens and buttons shown aren’t as prominent in the frame as whatever else is going on around them, however. With that being said, the famous climatic moment that occurs within the psychedelic space vortex could potentially be triggering for some viewers. It is very dependent on the neon-esque landscape of its colors, while also being one of the longest scenes of the whole film. This entry was posted in Uncategorized and tagged 2001: A Space Odyssey. Bookmark the permalink. Pingback: Cinephiling With Epilepsy & 2015 Releases: June ’15 in Film | Films Like Dreams, Etc. Pingback: Looking Forward: December ’15 in Film + A 2015 Recap | Films Like Dreams, Etc.